Tony Cook was born and raised in rural central Illinois. His father Terry was an avid railfan and model railroader and Tony grew up surrounded by trains. Tony’s first train trip was on Gulf, Mobile & Ohio and the Milwaukee Road from his home in downstate Illinois to Milwaukee, where his father was working for Walthers in the late 1960s. An avid collector, Tony documents model railroading’s past with his HO-Scale Trains Resource collection of websites. Tony’s past efforts include handing marketing and public relations for Union Station Kansas City, where he served for a dozen years before moving to rail publishing and joining the team at White River Productions. In 2011, Tony was named editor of Model Railroad News, which he continues to edit to this day. 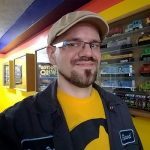 In 2014, Tony joined the staff of Railroad Model Craftsman as associate editor, contributing product reviews and announcements. In addition to trains, Tony also enjoys electronics, cars, broadcasting, and farming. Tony lives in rural Missouri in a 100-year-old home he’s renovating and helps with a friend’s cattle farm in his spare time. Tony Lucio grew up in a Chicago donut hole surrounded by tracks feeding one of the nation’s busiest railroad terminals: the Belt Railway Company’s Clearing Yard, where almost anything and everything from everyone might be seen. The railyard was a backyard and unlike most residents, he saw past the railroad nuisance and into wonderment. When the G.I. Joe set loco from his Christmas train set expired in smoke just a few months into service, a deep fascination for mechanics was fostered. Several years passed before his first visit to an honest hobby shop begat “real” model railroading. Though his life is full of distractions, trains of all sizes have been a constant thread of interest. He models the Saint Canard Midland as a proto-freelance HO Midwestern from 1975-1985, influenced by Chessie System and The Rock. Though constrained to 4×8 for far too long and counting, railroad-stalking roots find him with an absurd number of freight cars. He’s restored three Penn Line Reading Crusaders (though he has never owned one), and created graphics and decals for projects displayed around the world. Despite awards at the proto-realistic modeling level, his philosophy remains firmly rooted in the tagline “Model Railroading is Fun” – so he doesn’t always take the hobby too seriously. Tony’s hobby credits include efforts published in Model Railroader, Railroad Model Craftsman, Scale Rails, New York Central System Historical Society’s Central Headlight, and various online resources. He edited the NMRA MCR Division 10 newsletter for a few years, and ran a website documenting TYCO history and repair for several more. In 2011, he joined Model Railroad News as a reviewer. An advocate of public service, Tony built an information technology career supporting education, healthcare, and court of justice pursuits. In addition to all facets of model trains, he is endlessly distracted by repairing and restoring vintage electronics, cars, clocks, furniture, and pinball machines. He also enjoys hiking and biking, history, abandoned places, and graphic design. He currently lives in Frankfort, Ky., with his wife and two daughters.